An Evil Dragon Digimon that is known and feared as the "Many-eyed Demon". 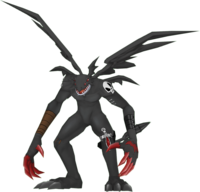 As a demon beast that was summoned from the Dark Area by the messenger of darkness, Devimon, there are no other Digimon as evil as it is. 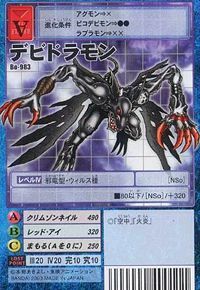 Although it is a Dramon-species Digimon, its limbs are unusually developed, so it cuts the opponent to pieces with its elongated arms, and flies about the darkness with its sturdy legs and wings. Its personality is the epitome of wickedness, and it is unmoved by a spirit of compassion. If it glares at them with its four eyes burning in deep crimson, the opponent becomes unable to move, and it will chop up their unresisting body. Also, the tip of its tail is able to open up and take on the shape of a claw, which can skewer the opponent. 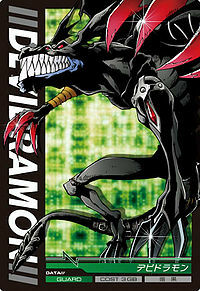 This Digimon was probably produced by the evil feelings of Hackers who were abusing the Computer Network for their own selfish desires. Its Special Move is chopping up the opponent with its gigantic claws, and beating them all bloody (Crimson Nail). This profile matches its partner in the Digimon Reference Book, except for the following highlighted difference. 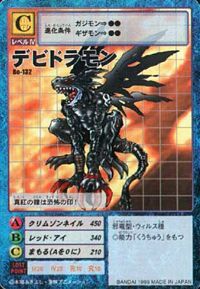 — Digimon Adventure: "Vamdemon, the Castle of Darkness"
The "Many-eyed Demon", Devidramon. Virus, Adult, Evil Dragon Digimon. Its Special Move is tearing the opponent to piecess with its sharp claws (Crismon Nail). — Digimon Tamers: "Guilmon Evolves! The Great Decisive Battle in West Shinjuku"
Title: 「複眼の悪魔」 — "Many-eyed Demon"
| Devi is short for Devil (「デビル」). | Dra is short for Dragon (「ドラゴン」). Anime/Manga Digimon Adventure: "Shining Wings! Garudamon"
Crimson Nail  クリムゾンネイル Kurimuzon Neiru Crimson Claw Slices into its foes using its red claws. Red Eye  レッドアイ Reddo Ai Red Eyes, Red Eye Unleashes an evil power from its eerie eyes that paralyzes the enemy. 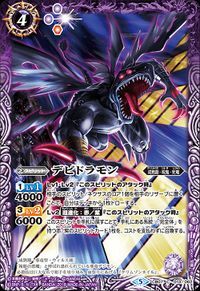 Demonic Gale  デモニックゲイル Demonikku Geiru Dark Gale Shoots waves of wind by swinging its arms, or unleashes a dark electrical storm from its mouth. Tailmon used her Holy Ring to cause statues of Devidramon in Vamdemon's castle to come to life. Vamdemon also used Devidramon to pull his carriage. 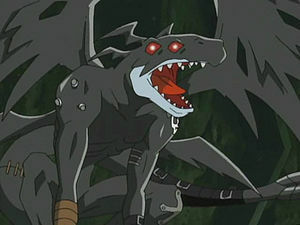 The Digimon Kaiser controlled several Devidramon with Evil Rings. A Devidramon Realized inside of a too-small Digital Field, but was released when Impmon tormented it and accidentally punched a hole in the field. Guilmon evolved to Growmon and defeated it. Devidramon were part of the Bagra Army in Dragon Land. 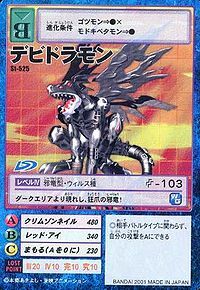 Devidramon is an obtainable Digimon. Evolves from Gizamon (6+ DP) and can evolve to Gigadramon (0+ DP). 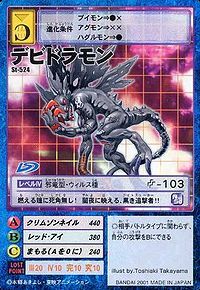 Devidramon appears as an obtainable Black Card. 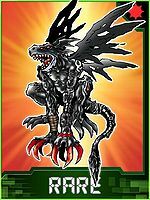 Can be evolved from Tukaimon if above level 22, Dragon EXP 350, and Dark EXP 300, or can be found at Shadow Hell. 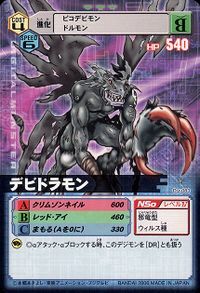 Can evolve to Chimairamon if above level 44, Dark EXP 11000, and already befriended Chimairamon, or Gigadramon if above level 40, attack 195, and Machine EXP 4400. 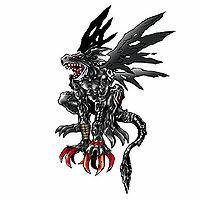 Evolves from Gazimon, Gizamon or Agumon (Black). Can evolve to Megadramon, Cyberdramon or Skull Greymon. Devidramon is available as a Digimon Medal. Evolves from Gazimon or Gizamon. Can evolve to Metal Tyranomon. 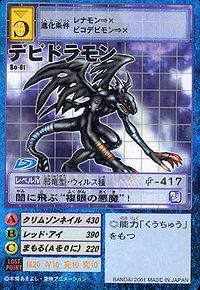 Devidramon is an enemy Digimon in Area 04, 05 and 06. Evolves from Impmon or Candmon. Can evolve to Cerberumon, Delumon, Pumpmon or Piccolomon. Can be obtained as a Burst Evolution of Candmon. This minion of evil shows its blood drenched claws on moonless nights! It has no blind spots in its burning eyes! This Night Stalker shines in the dark of night!! This crazed-clawed, wicked dragon appears from the Dark Area! Its crimson eyes are signs of terror! A "Multi-eyed Demon" who flies through the darkness! Called upon from the Dark Area by Devimon, this demon beast was born from hackers who used the network for their evil deeds. Anyone caught in the gaze of its four shining red eyes will become unable to move. An Evil Dragon Digimon that is known and feared as the "Many-eyed Demon". 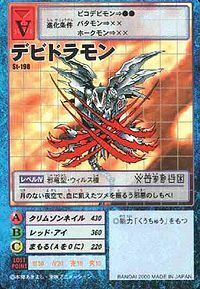 Its Special Move is chopping up the opponent with its gigantic claws, and beating them all bloody (Crimson Nail). This page was last modified on 11 March 2019, at 22:40.